As I sit here writing this, I cannot help but reflect on the significance of this day. In Christianity, today marks Good Friday, the day that Jesus Christ went to the cross to pay for our collective sins. In doing the research for my book, Where Was God?, I delved deeper into this horrific event. It is truly a very humbling experience when you realize just how much pain and suffering was endured for us. As much as I thought I knew the story, I came away with not only a deeper appreciation of what Christ did for us, but also a deeper understanding of the history behind it. I think this is something that most people do not truly understand. Sometimes I feel that we treat Him as a mystical figure, instead of a historical one. Sadly, most do not understand that there is history to the story of Christ. Among New Testament scholars, there is little doubt that Jesus Christ lived. While the most detailed story of Jesus’ life is contained in the four Gospels, they are not our only source. First-century Jewish historian Flavius Josephus referenced Jesus twice in his twenty volume history of the Jewish people. Additionally, Tacitus, the first-century Roman senator and historian, referred to Him in his history of Rome. There are other anecdotal references to Jesus from a wide variety of non-biased sources. Even beyond Christianity, members of the Jewish and Muslim faiths also acknowledge the existence of Jesus. If you are interested in learning more, I would highly recommend taking a look at, Where Was God? Today also marks two very significant events in American History. On April 19th, 1775, British troops, who had been sent to seize colonial weapons, fired the first shots of the American Revolutionary War, when they confronted about eighty militia members at Lexington, Massachusetts. Eight militiamen were killed in the initial confrontation at Lexington, but upon arriving in Concord the English were met with a much larger force of around four hundred. These two battles would set the stage for the war that would ultimately secure American independence. On April 19th, 1995, America was shaken to its core by the terror attack at the Alfred P. Murrah building in Oklahoma City, Oklahoma. This attack left nearly seven hundred injured and one hundred and sixty-eight dead, including four members of the United States Secret Service. At the time I was a member of the NYPD’s Intelligence Division and was sitting inside a USSS Suburban, on a protection detail, when the call came over the radio about the attack. There are no words to describe the feelings you get, as you are processing the fact that your country is under attack, and wondering if you are next. It was an unfortunate experience I would face again on September 11th. As an author, I cannot begin to tell you just how incredible the feeling is when your book reaches that best seller status. No, it isn’t the NY Times of the USA Today list, but it is a start and I want to share my pride with you. This week, my non-fiction book: Where Was God? 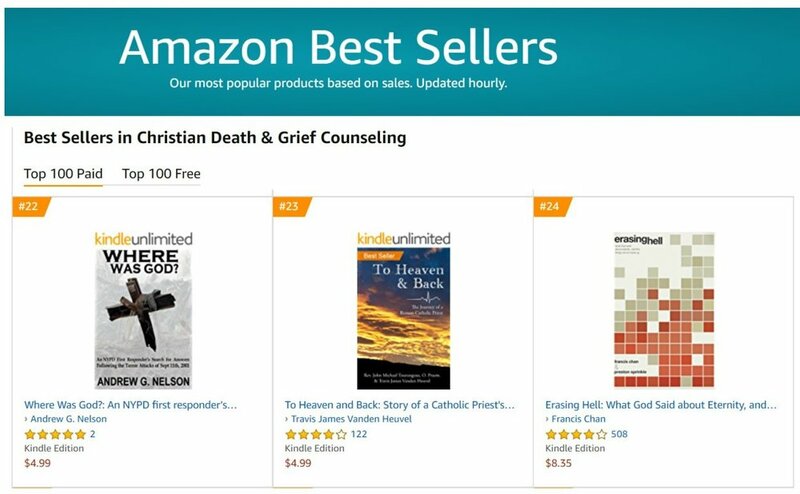 : An NYPD first responder’s search for answers following the terror attack of September 11th, 2001, hit the Amazon best seller list, reaching the #22 spot. It’s moved a few slots over the last few days, but I’m still proud that this book is reaching an audience that might find comfort in my findings. This journey started with God and I owe any and all success to him. Readers of my books know that I reference a lot of different places and agencies. Many of them are part of the backstory for my characters, so I thought I would start something new called: Throwback Thursday. From time to time I will present you with a brief history of one of the units or locations I write about, to help you get a better understanding of the character’s story. Today’s Throwback Thursday post pertains to something near and dear to my heart: NYPD intelligence. In Perfect Pawn, readers are introduced to retired NYPD Detective James Maguire. For a period of time he was assigned to the NYPD’s Intelligence Division (now known as the Intelligence Bureau). What many do not know is that the command’s roots can be traced back to Lieutenant Giuseppe ‘Joe’ Petrosino and the Italian Squad. Lt. Petrosino was instrumental in pursuing the organized crime group known as the ‘Black Hand.’ Petrosino was killed while investigating the group in Palermo, Sicily. It would be nearly fifty more years till the Intelligence Division would be tasked with providing dignitary protection, but in an ironic twist, during his infiltration of an Italian anarchist group, Petrosino uncovered a plot to assassinate then President William McKinley. Petrosino alerted the Secret Service, but the President ignored the warning, even after then Vice-President Theodore Roosevelt, who had been an NYPD Commissioner, vouched for Petrosino and his abilities. As warned, the group followed through and McKinley was assassinated during his visit to the Pan-American Exposition in Buffalo on September 6, 1901. Following Petrosino’s own assignation, by the Black Hand in 1909, Acting Detective Sergeant Charles Corrao took over the Italian Squad. At that time the city was dealing with a string of attacks with explosives, as the Black Hand had now begun to use bombs as a means of extortion. On one occasion Corrao grabbed a bomb from Black Hand member Giovanni Rizzo’s hand and defused it while the man fled. After a subsequent chase, and an exchange of gunfire between the two, Rizzo was captured. For his actions, Charles Corrao was awarded the newly adopted NYPD Medal of Honor and the Rhinelander Medal for Valor on May 18, 1912. The NYPD’s Bomb Squad has its foundation in these early bomb investigations. As the years progressed, the role of the Intelligence Bureau would adapt and expand. What started with investigating Italian organized crime (the Black Hand Squad) soon included communist activities (the Red Hand Squad). The Red Squad then became known as the Bureau of Special Services and Investigations (BOSSI), which was focused on domestic groups like the Black Panther Party, Weather Underground and the Students for a Democratic Society. Along the way, they picked up the dignitary protection assignment. In the early 70’s BOSSI was reorganized and retitled the Intelligence Division. Following the September 11th Terror Attacks it was expanded to a global unit and renamed the Intelligence Bureau. My time in the Intelligence Division was an incredible part of my career with the NYPD, so it is only fair that it also plays a pivotal part in the character of Maguire. I’ve stood next to presidents, the Pope, and more foreign and domestic dignitaries than I can count. I’ve ridden in motorcades and I’ve watched them with a birds-eye-view from helicopters. It is simultaneously exhilarating and nerve-wracking. One of the things you learn quickly is to never be complacent. One story that drove that point home rather quickly occurred back around 1995/6. The Israeli Prime Minister, Shimon Peres, was traveling in his motorcade. At the time, because of the elevated threat risk, the Israeli PM got what amounted to a Vice-Presidential level motorcade package. At the last minute we got word that a decision had been made to take the secondary route, which involved the Belt Parkway. I was assigned to huntsman, the helicopter which provides aerial surveillance along the motorcade route, and things were going along quiet well; at least until the thought occurred to me that traffic was really, really light coming from the opposite direction…… Anyone who has spent 15 minutes in New York City can tell you that traffic is never light. I instructed the motorcade to slow down and told the pilot to head forward to see what was causing the delay. My initial thought was a motor vehicle accident, which would bring the motorcade to a halt unless we got a lane cleared. My fears were surpassed when I gazed out the front window of the helo and saw that the Mill Basin drawbridge was in the upright position as a large vessel lazily made its way in from the Atlantic Ocean. This resulted in an immediate frenzy of colorful communication between me and my USSS counterpart, as we tried to get the motorcade to come to an almost screeching halt. I will never forget the sight of the motorcycle officers, from the Highway Patrol, racing up to the drawbridge to get them to drop it back down in place. How we managed to unscrew that one in time, remains a mystery, but we did. The motorcade never stopped moving and I don’t remember ever using the Belt Parkway for as long as I was in the Division. In Chapter Five of Perfect Pawn I provide the reader a glimpse into the world of presidential protection. For many, it is the closest they will ever get to being inside the bubble. It was from this period of time in my career that I drew on inspiration for not only the role of Maguire, but his friend, Rich Stargold, who is a composite of some of the people I worked with in the Secret Service. Someone once asked me if I missed it and my answer is: Yes, every single day. When I was coming up with the design for the cover of, "Where Was God?" I wanted something powerful, something which would evoke the raw emotions that we felt in the aftermath of that horrific day, but also one that conveyed a sense of hope among the devastation. I think it is safe to say that all of us were aware of the World Trade Center Cross, the steel I-Beams that were sheared off at the joints, forming the shape of a metal crucifix. While doing research I stumbled upon an iconic photo that seemed to convey all of the elements that I was looking for. After doing some serious internet sleuthing I was able to finally locate the photographer, Anne Bybee, who graciously gave me permission to use this extremely powerful photo for the cover of the book. I am deeply honored. Many have dismissed these 'crosses' as just the end result of metal fatigue, but to those of us who were there, they took on an entirely different meaning. They were hope, they were comfort, they were a reminder that we were never alone.